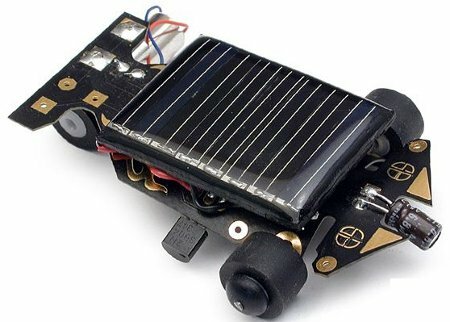 Solarbotics' SolarSpeeder v2 Kit is a very quick Solaroller that can cover 3 meters (10 feet) in under 40 seconds in direct sunlight. The SolarSpeeder has a strong heritage in Solaroller racing. Solaroller racing has two solar-powered cars race side-by-side down a one meter (3.3 foot) track. until now they complete the meter in less than 20 seconds! Now updated with MillerEngine Technnology! So what does that mean? It means a big improvement in performance at not increase in complexity or cost! Simple to construct and a blast to watch in the sunlight!